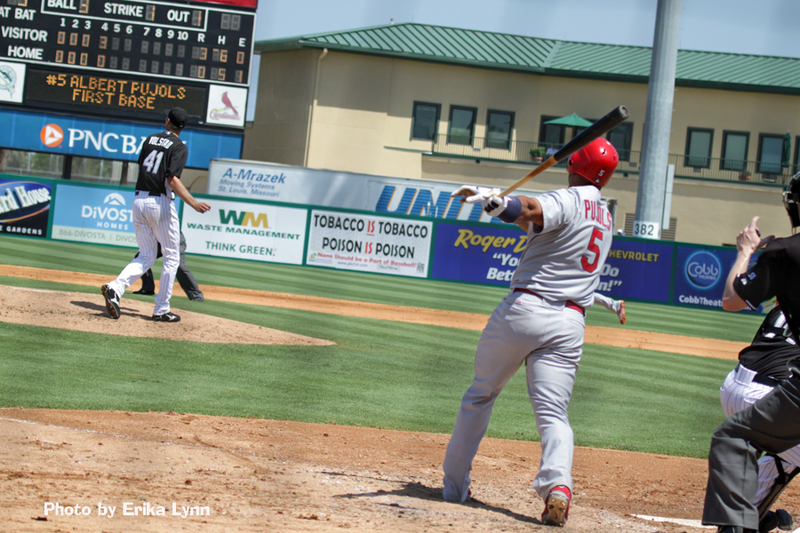 With only hours left until Opening Day at Busch Stadium and a full season of Cardinals baseball ahead of us, here’s the final part of my Spring Training report with highlights of my time in Jupiter watching our boys. Some tidbits of Spring Training Magic. Enjoy! After driving the 4 hours from Tampa, we arrived at Roger Dean Stadium less than 2 hours before game time on Friday. We hit the team store briefly, then headed to the backfields as the small crowds were dispersing. Figuring we’d missed the fun, we weren’t expecting much. But we caught some pitchers taking batting practice, having fun competing for total distance, etc. Kyle Lohse, Jake Westbrook and Kyle McClellan were taking turns in the cage and after they were finished, all three signed autographs for the fans that were still hanging around. In my opinion, the best part of Spring Training is the accessibility to the players. (For autographs as well as great photo opportunities) The environment is welcoming and the smaller venue affords a better chance to interact with these players we watch from a distance during the regular baseball season. 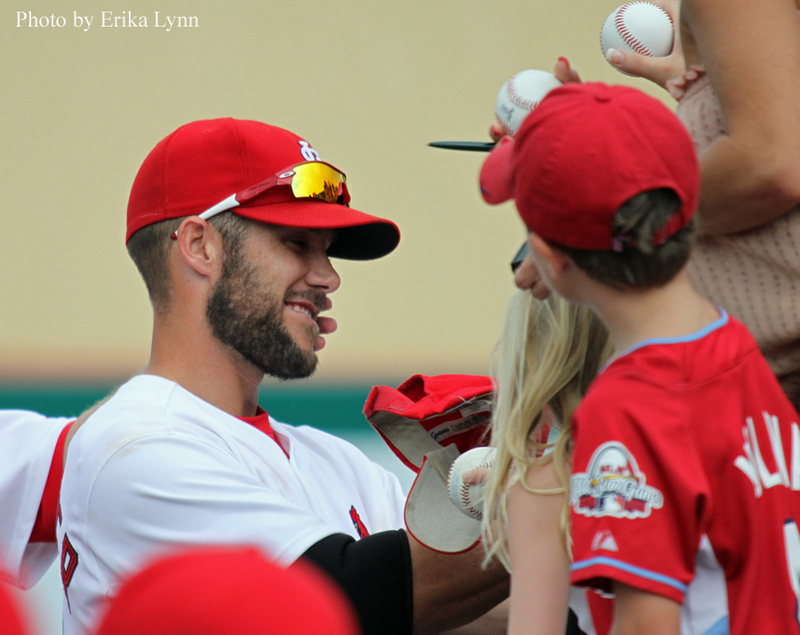 I adore observing Cardinals interacting with fans, especially with kids. Some of the guys are admittedly better about it than others, but those brief moments when a favorite ballplayer stops to take a picture or sign an autograph often will be more poignant memories for fans than the action on the field that day. We certainly didn’t camp out for hours or pester players for autographs. Several players voluntarily made themselves available to sign for fans after practice and before or after games. I know some players are jaded by the fact that autographs may end up on Ebay instead of as treasured spring training mementos. However the players who take the time and spread some joy with a pen on a baseball make long-lasting, positive impressions on fans. Those moments are priceless, no matter how old you are. Well, those are a few of my highlights from Spring Training. 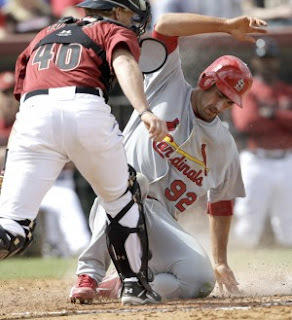 Game One of the 2011 Cardinals season is tomorrow!!! We here at Cardinal Diamond Diaries look forward to sharing the season with you all! Spring Training means different things to different people. To me, a trip to Florida in late March when the weather is warm and Opening Day is juuussssst around the corner makes perfect sense. Mornings spent soaking up the sights and sounds of baseball drills on the backfields of Roger Dean stadium are not too chilly. Starters are going longer into games and the lineups are full of actual, live 2011 Cardinals!! 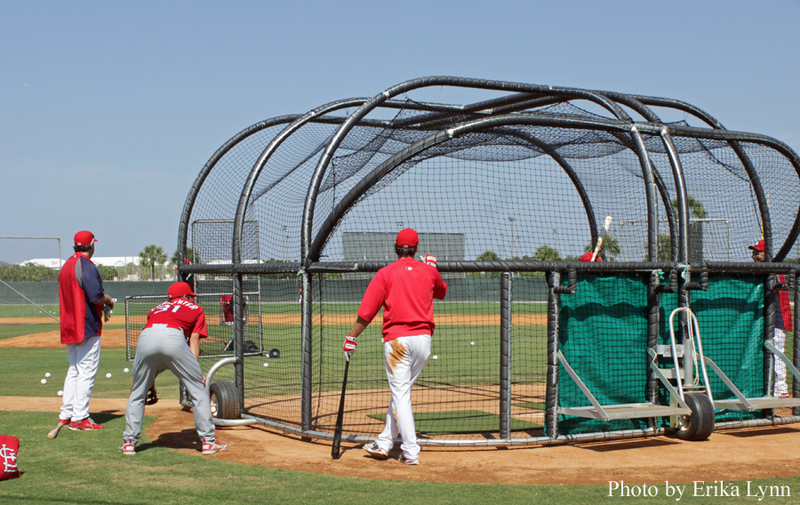 It’s as close to “real” season baseball as possible… while still in the cozy setting of the Cardinals Spring Training facility, surrounded by palm trees, sea breezes and sunshine. Previous Spring Training trips (’09 and ’10) were hard on Hubby. In 2009, new fan syndrome was in full effect. I’d be up at the crack of dawn, not wanting to miss a single glimpse of a guy in a Cardinal uniform. I was on Yadi Watch constantly. We hadn’t heard about the opportunity of watching morning practice drills. I took a total of 178 photos (many of them were blurry because I was shaking from the excitement of it all.) 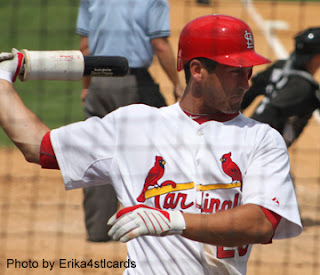 I noticed a guy named David Freese (#66) and took pictures of Chris Duncan and Rick Ankiel. We saw two games and fell in love with the Spring Training atmosphere. In 2010, new fan syndrome was still rampant. PLUS I was armed with useful information from a baseball fan’s best tool: twitter. For example, this time I knew about Roger Dean stadium’s back fields, morning workouts & autograph opportunities, and the existence of Pyros Grill. I was on Matt Holliday watch. I took over 700 photos (some were still blurry because Brendan Ryan was spinning too fast for my camera or because I was drooling -just a little- over David Freese.) I took pictures with Adam Wainwright and Kyle Lohse. We saw 4 games – 2 home and 2 away. I toured a baseball museum (because Aaron Hooks offered me free tickets if I’d review it for Cards Diaspora… #win!) Highlight?? David Freese signed my shirt!!! I was addicted to Spring Training. Baseball overdose at it’s most extreme. Last week we even went to see some *gasp* non-Cardinals games. In fact, while Hubby was meeting friends for a day of fishing (he saw dolphins!! ), I ventured off all by myself to watch the Phillies play the Braves. That experience was a perfect Spring Training warm-up. I was a berm bum, taking in a game whose players/teams I was less familiar with. Honestly, I bought that ticket hoping to see Roy Halladay or Cliff Lee pitch for the Phillies and fully expecting to be cheering on former Cardinal Joe Mather in a Braves uniform. Alas, none of my hopefuls were in the game. So, I spent a lot of time watching just baseball. I didn’t care who won or lost. And you know what? I loved every second of it. The view from the grass was different, enlightening – the game looks different and catches that seem so simple when watching from the infield are suddenly a heckuva lot more impressive when the fielder manages to intercept a rocket while chasing across the outfield grass. It was baseball. Good baseball. Man, you gotta love Spring Training! Yay!! – 78 degrees, light winds and sunshine. – Ryan Madson, in all his Madson glory, LIVE! That same night we went to watch the Yankees take on the Astros at the Yankees Spring Training complex. We were late to the game and the gate guardian wouldn’t let me bring in some of my camera gear. So we were even later after lugging it back to the parking lot again. No Mariano Rivera appearance. (So far I was shooting 0-fer on my Spring Training hopefuls.) However it was a night game and the stadium was full of New York fans. Suffice it to say, that was a FAR different experience than Roger Dean Stadium full of Cardinal fans at 1:05pm games. 😉 Again, I savored every second. Yay!! – Joba and Dave Robertson pitching relief. – Kettle corn for dinner! Boo – Gate trolls and repeat trips to the parking lot. With that, my Spring Training warm-up was complete and we had a 4-hour drive to Jupiter, Florida (near West Palm Beach) for Cardinals camp the next morning. Needless to say… it was hard to fall asleep that night. 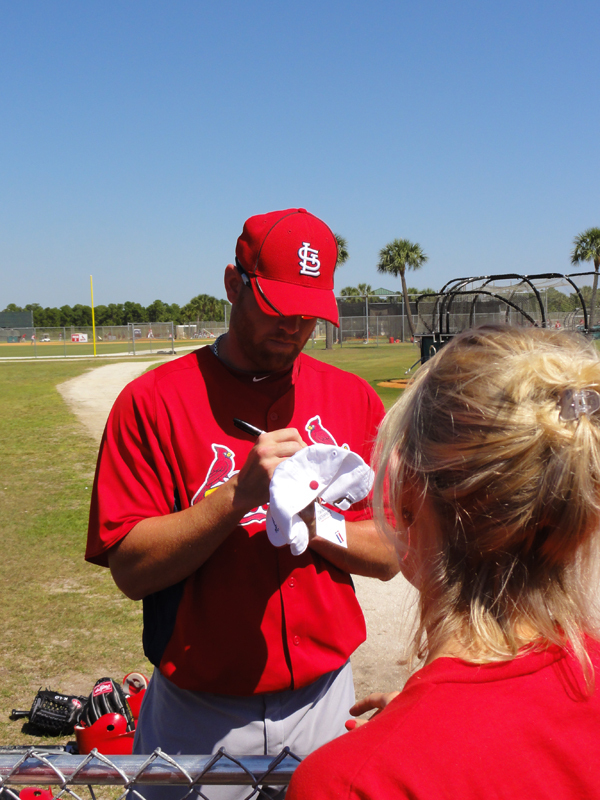 Next post: my stories from Jupiter and my time at Cardinals’ Spring Training: running into Chris Carpenter out of uniform, on the sidewalk by the stadium; the batting practice frivolity of Lance Berkman; autographs, meeting players, and my favorite Spring Training game moments. Fitting it all in a blog before Opening Day (tomorrow) was poor planning… but I wouldn’t have it any other way. Like I said, we all do Spring Training a little differently. I spend a lot of time taking pictures instead of keeping a scorecard. I love watching ballplayers sign autographs and how they interact with fans. Spring Training provides a unique opportunity to live and breathe the beginnings of baseball season…. until the big show begins. Those of you that know me a bit know that I get really excited about the beginning of the baseball season. First day of Spring Training? Check (I wore red). First spring game? I found ways to watch that silly little Gameday box from my desk at work (and I wore red). First televised game? I again snuck peaks at the game (despite being unable to listen to most of it) from work (and wore more red). Each and every first made me smile, caused me to comment, and gave me reason to talk about baseball a little more than usual. But when the game ended and the final score was posted, I shut it down. I didn’t fuss that too many men were left on base or get irritated at why Tony used this reliever instead of that one. Because it didn’t matter. Spring records mean nothing (although I imagine being incredibly bad or blowing everyone out would turn heads). I have no idea what the standings look like for the Grapefruit League, nor will I be looking them up anytime soon. Pitchers: I am a huge Kyle McClellan fan. Really. I want him to succeed in whatever role he finally lands in. However, it seems that every year he gets put into the rotation mix during Spring Training, I pull for someone else. Why is that? It’s because I constantly fall into the belief that while fifth starters can be found through any number of ways (and the Cardinals have a history of… interesting… fifth starter names over the past few years), strong and reliable workhorse bullpen arms are a little tougher to come by. I don’t doubt Boggs and Motte. I love those goobers and the flaming fastballs they shoot out of their arms like cannons. I do at the same time love that McClellan can use an assortment of pitches and be the kind of setup man that TLR loves to have and use. I was pulling for Lance Lynn to have the kind of spring that Jaime Garcia did last year. After watching him today, I’m still unconvinced that he absolutely couldn’t do it. His outing was okay, 4 innings, 3 hits, 2 runs and 4 strikeouts is nothing to be super critical of, but not eye opening either. McClellan has done nothing but mow ’em down. I want it to be McClellan. I suppose I’m pulling for Fernando Salas to get that last spot in the pen, but as Derrick Goold noted this afternoon, the team hasn’t decided yet. I’m not sold, but I feel better about this all now than I did a couple of weeks ago, that’s for sure. The other pitcher discussion has to be the combination of Jake Westbrook, Garcia, and Lohse. Quick, if you would have picked one of those three to have a strong spring, which would it have been? I would seriously laugh if you had said Lohse. NO ONE saw it coming. Will it last into the regular season? I certainly hope so. 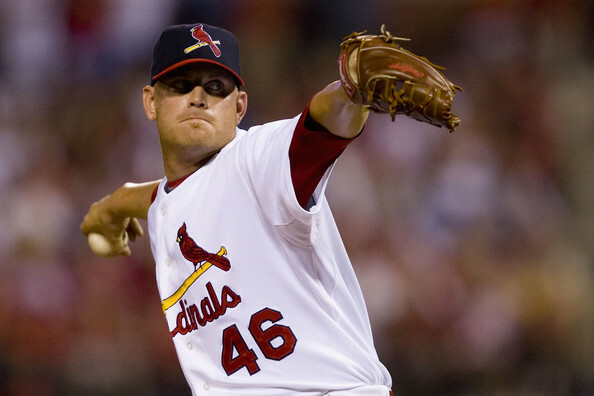 I don’t expect him, Westbrook or Garcia to take the place of Adam Wainwright (*sniff*… I’m okay, it’s dust or something), but feeling like we could rely on him to be more like the pitcher we saw in 2008 would be fantastic! Is it time to get concerned about Westbrook feeling like he hasn’t really been able to get his pitches under control or Garcia not feeling worried about his not great start or not working counts well? I suppose that time is getting close. The games are starting to mean something (even if the final scores still do not). Outfield: Color me not really worried about the outfield. Holliday and Rasmus are obviously just fine, and I think Berkman will be too. He probably cannot and really should not be playing every game like he thinks he can, but I feel confident enough in Jay and Craig being the other two outfielders that it should work out nicely. Should Berkman go down, it would not be the end of the world. I just hope he doesn’t. That’s all. Infield: The four starters are clear – Pujols, Skip, Theriot, and Freese. No questions there. The two bench spots are the trick. Most assume that Tyler Greene will take one of them, but then it comes down to Daniel Descalso or Matt Carpenter. At the beginning of spring I would have said Descalso, no question. I fell in love too early, then felt Carpenter sweep Cardinal Nation collectively off our feet. He’s not on the 40 man roster, but man, he could be. The fans like him. The front office likes him. Tony likes him (and his work ethic… so… he’s the anti-Brendan?). Carpenter plays third. In reality, he only plays third. We have a third baseman by the name of David Freese. Freese has obviously had his share of boo-boos and injury mishaps, and the team is taking care of those and shielding him from doing too much too soon, but really, do you want two players on your team that only play third base? Greene can play second and short, but Descalso can play second, short, and third. Versatility will get you everywhere on a Tony team, just ask Aaron Miles. Is there a right or wrong answer as to who to take north? I’m not sure there is. The point will most likely be moot anyway whenever Nick Punto (Yeah, I forgot about him too) comes off the disabled list. Both players have played well. Carpenter has gotten more print, but both have averages over .300, both have played solid defense. If you want to argue logistics, then fine – Descalso has experience at the big league level, although very limited (11 games and 37 plate appearances), while Carpenter hasn’t played a game above AA. That is definitely a factor. Don’t sell either short. However, just because the games are starting to mean something doesn’t mean it’s been long enough to fall for either player. Even if it was only one game…I finally made it back to Spring Training!! Finally back after 5 long years! It has been 5 years (almost to the week) since I last attended a Spring Training game at Roger Dean Stadium in Jupiter, Florida. March 2006 was also the first time I ever went to Spring Training. We also know what happened in October 2006….so if I am any kind of luck, 2011 could potentially be a Red October. 🙂 Of course I am just being a little superstitious and silly, but it is always fun to think about. For the last Spring Break of my college career (hopefully! ), I visited a friend in Miami, Florida. I told her that I would do anything else during the week as long as we could go to a Spring Training game in Jupiter. Knowing how obsessed I am with baseball and the Cardinals, she agreed, even though she barely knows anything about baseball. I promised her that I would teach her as much as I could and we would have a great time. swear his eyes were closed! In my usual over-zealous fashion, we got there before the gates even opened and I spent a good 20-30 minutes in the official team store buying quite a few goodies. Don’t worry, I did bring back my little sister an official Spring Training t-shirt. I knew she would have been disappointed if I didn’t. Once the gates opened and we got in, I made my way down to the first row on the 1st base side of the stands. I parked myself right in front of the bullpen pitchers mound and waited for players to begin to enter the field. After about an hour of waiting, finally John Gast, LHP, was the first to enter the field. I think about 3 people bothered even showing interest in him before a little boy in the berm asked for his autograph. He turned around and gladly gave it to him. After a while several more players began to enter the field, with Yadier Molina being one of the first as usual. As I watched him warm up, catching soft-tossed balls from bullpen catcher Murphy, I swear he actually did close his eyes when taking those warmup tosses. (remember the commercial from 2009 when he was blindfolded catching baseballs??). More and more players entered the field, and I got that same excited feeling I do every new season…I was shaking I was so excited. I think this is probably the coolest part of spring training. Instead of the players entering the field from the dugout, where very few fans are able to see them up close, they enter from the outfield where the berm is, so many fans are able to see the players up close and personal and get autographs and chat with their favorite players. 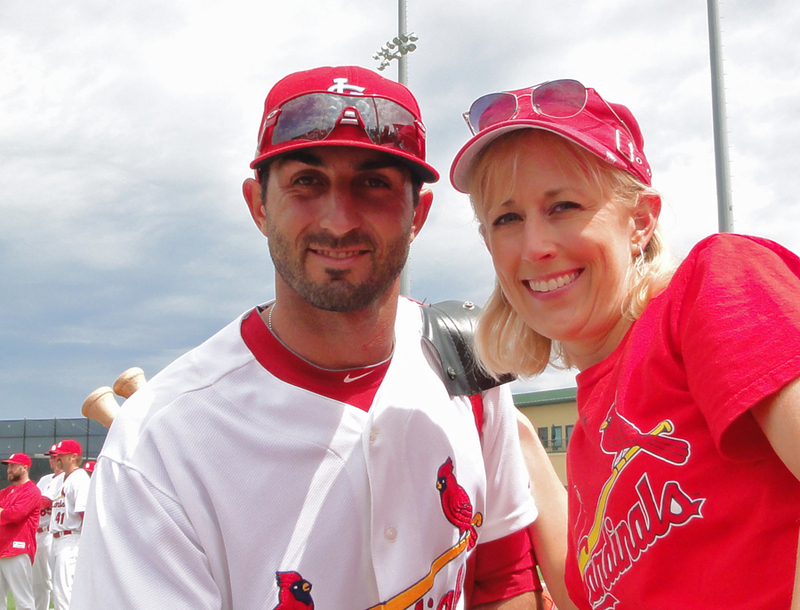 I was lucky enough to meet Daniel Descalso & Mark Hamilton while they were signing autographs near the Cardinals’ bullpen on the first base side. If you have read Daniel’s MLB blog (http://danieldescalso.mlblogs.com/), you know that he has given us a really great inside look on what a day of spring training is like. When I saw him coming around the corner signing autographs, I was excited that I would hopefully get to meet him…and I did. Everyone else just seemed to be asking for autographs, so I asked for a picture as well. 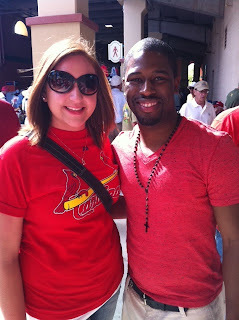 My list of pictures with Cardinal players is getting checked off quickly. 🙂 A little while later, Mark Hamilton was doing the same thing, and I got a photo with him as well. We continued to watch Jaime Garcia warm up before we got booted out of the seats we were using. We headed to our seats in the second level and got to watch an awesome baseball game against the Boston Red Sox. I was actually really glad I got to see this game because I don’t think I have ever seen the Red Sox live and in person. There were a lot of Red Sox fans sitting around us, but thankfully the guy next to me was a Cardinal fan, and I got to impress him with my knowledge. I remember him saying to me, “yeah, you need to work for this team, you know so much!” I hope this comes true someday. We all know it would be a dream come true for me! Prior to the game, I had contacted one of my favorite Cardinal twitter-ers, @CJBeatty44, to see if I could meet him. Fortunately, he was supposed to be attending the game before his workouts started the next day! He so politely obliged and we decided to get in contact with each other on March 8th at the game. After several emails back and forth, we realized that we were actually sitting one section away from each other! So, before he had to leave (those dang American League teams cause games to be sooooo long! ), we met up. Ok, people, if you enjoy CJ on twitter, you would love to meet him in person! Such a nice, humble guy. I must admit, when I read on his stats that he was 5’10”, I wasn’t sure what to expect (honestly, I thought I might be a little taller than him because I too am 5’10”), but we were the same height. Good for you CJ, I hate it when players fudge their height on their stats page. Haha. Unfortunately we couldn’t spend much time chatting, his girlfriend only had a few more hours to spend with him before his season started, and of course I wanted to watch the rest of the game. However, I can say from what I have read on his website (www.cjbeatty.com) he is a sincerely genuine person, and any Cardinal fans that get a chance to meet him would be very lucky. I am happy to say that we are now friends and I am looking forward to watching his journey as a member of the Palm Beach Cardinal and hopefully on up through the organization and as a St. Louis Cardinal one day. CJ, thanks so much for meeting me! I wish you the best of luck in 2011 and in the future! Cardinal fans, I am soooo excited for baseball season! I know we have already had some setbacks and some scares heading into the 2011 season, but I still have faith…I think that there will be several young-veterans and other younger guys (baby birds maybe) who will be able to step up and take advantage of an opportunity. Next time you hear from me will probably be right after Opening Day! I will be there with bells on and I can’t wait to cheer this team to victory in 2011. All things that have happened thus far, I am excited and I am ready to see what this team does this year. I am not extremely superstitious, but remember, I was last at Spring Training in 2006, and we know what happened then…lets hope for the same in 2011! GO REDBIRDS!! PS…all of these are my pictures, if you wish to see more, I can post em on twitter! 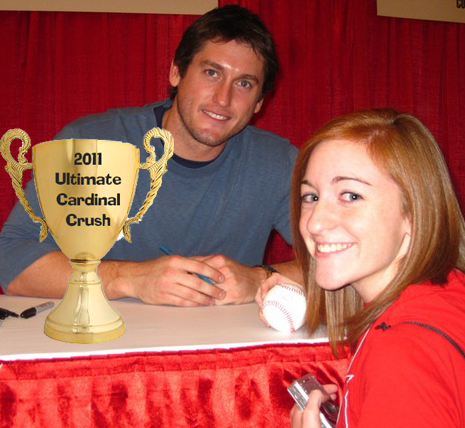 Perhaps winning the CDD’s 2011 Ultimate Cardinal Crush trophy brought Dave some luck? Cardinal Nation breathed a collective sigh of relief as David Freese made his 2011 debut at Spring Training today in a game against the Minnesota Twins and did not injure either of his lower extremities. Over the weekend, word that Dave’s first Spring Training appearance would be delayed after he *sigh* managed to hit a foul tip off his toe in a simulated game brought both groans and jabs at the seemingly injury-prone Cardinal hot corner. Nevertheless, Freese’s outing today went very, very well. Still cautious running the basepaths, Freese managed 2 hits, 3 RBI, 2 assists and played 5+ innings as the Cardinals beat the Twins, 10-4. It was a pleasant surprise. Dare we hope for more of the same?? The Cardinals have warned us that Freese’s playing time will be limited as he continues to strengthen his ankles following surgery this offseason, cautiously predicting he will play every other day and working up to playing 2 out of 3. After the good showing today, I gotta say that while I’d love to see more of Freese and his magical RBI bat, I am quite content to be patient. And swing away, Dave! The scoreboard and the infield both look better with you in the game! 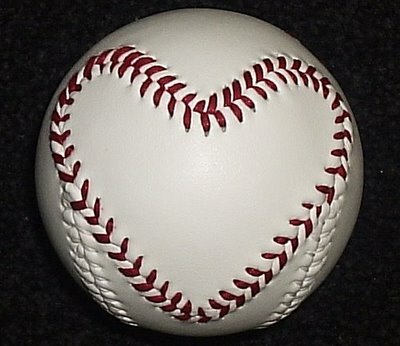 Know what I love about baseball? Well, besides double plays, pick-offs, pay-off pitches and watching the fellas digging in at the plate? … I love how baseball fans who’ve never met before always find plenty to talk about. I love how it can bring families together at the ballpark after a grueling work week. I love that so many adults have treasured childhood memories of favorite baseball heroes or MLB game memories that they can recall in vivid detail. I love catching glimpses of Little Leaguers’ imagined visions of grandeur as they attempt to emulate their favorite MLB stars. My relatively young love of baseball has been fostered and encouraged by many people in my life. Some of those closest to me, like my darling Hubby, support my new passion with a wink and a smile (and trips to Spring Training!) My extended family and friends now keep closer tabs on the St. Louis Cardinals – and baseball in general. I smile to see an email from them checking in about Pujols news. It is just another reminder how baseball is a great way to casually reconnect. Baseball has enriched my life in so many ways. It has brought me closer to family, uncles and brothers-in-law, who now banter with me about the Reds and the Brewers. Baseball has connected me with a wonderful network of Cardinal fans through blogging and twitter, many of whom have become dear friends. I am ever thankful for the game and what it has given me. And I am looking forward to another season of the blessing that is baseball. Today’s Spring Training game is Cardinals vs. Twins at 12:05, central. David Freese makes his Spring Training debut at third base and Jake Westbrook is on the mound. Then Kevin (@deckacards) decided to call us out on twitter to Cardinals closer, Ryan Franklin (@Franky3131)…. 1. Even playful crush polls, much like junior high, can ruffle some feathers. 2. Write-ins and options for “other” will not cover you. 3. Men DO vote in crush polls but get more fun from stirring up trouble. Courtney presents Freese with the trophy! Honorable mentions go to Lance Berkman (7% of the votes), Chris Carpenter (5%), Matt Holliday (3%), Ryan Theriot (2%) and Jason Motte (2%).